We’re always up to something. Sometimes we’re even awake when we do it. Heavens to Betsy, our joints would just seize up if we didn’t have anything to do! So, with that in mind, here are the bits to whet your appetite. Make your juices flow. Whatever! And then there’s our Calendar – lots of events, trips out, happenings, court appearances etc. They’re all listed in the Calendar. Shopping! We couldn’t not have a shop! Oodles of t-shirts, mugs, quaint little tea cup and saucer ensembles and even bags and badges in our Sister Shop. 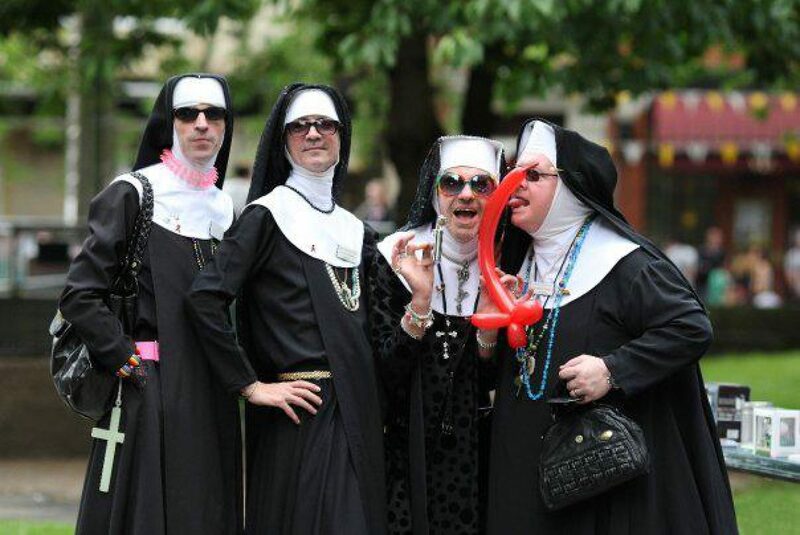 Welcome to the Manchester House of the Sisters of Perpetual Indulgence website. We’re part of a world-wide order of queer nuns. Some queerer than others. We get out into the community to promulgate universal joy and expiate stigmatic guilt. for their help in supporting us and helping fund our website. If you’d like to become a Friend of The Sisters, click here.